WRTC is a federally licensed FM radio station, operating at 89.3 MHz from the High Rise Building on Gallows Hill at Trinity College in Hartford, Conn.
A face for radio: A bantam “twists the knobs” in this 1953 cartoon. Broadcasting with an effective radiated power of 300 watts, our signal can be heard throughout metro-Hartford to the Massachusetts border, 24 hours a day, 365 days a year and online at www.wrtcfm.com. Aside from engineering services provided by the college, we’re an all-volunteer operation and the majority of WRTC’s funding comes from generous listener donations. Since its on-air debut Feb. 26, 1947, WRTC has taken pride in providing innovative, community-based programming. 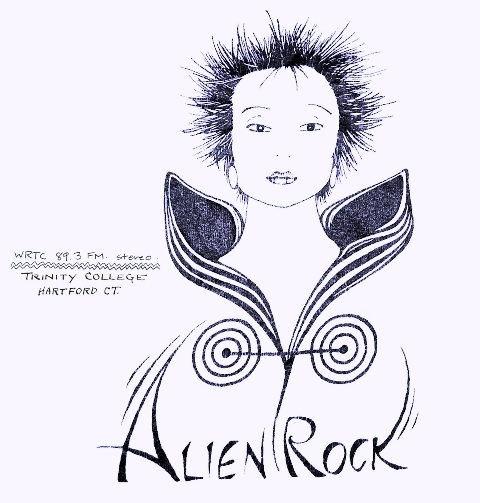 We were one the first stations in the Hartford area to play rock music and today, we air more than 40 hours a week of a wide range of rock styles. Back in the 70s, Alien Rock was one of the first programs in the state to introduce progressive, art and punk rock to listeners, but its roots are traced to earlier in the decade when host Andy Mitchell’s Don Quixote’s Travelogue first brought listeners the sound of “import” records from Europe and later, Japan. 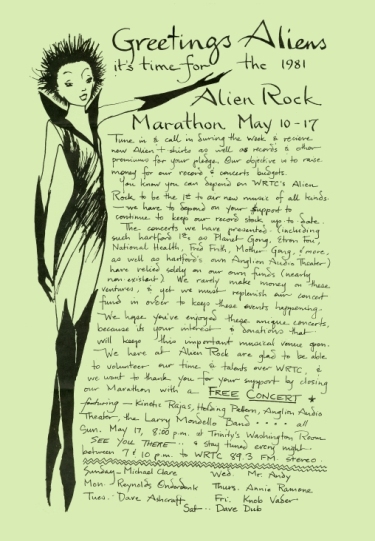 Mitchell would leave in 1973, but the cause was carried on by Andy Taylor and a year later, Michael Clare and Reynolds Onderdonk were on board, hosting Midnight Rock which later became Alien Rock. Decades later, the name remains. Getting creative: An ad that ran in a 1977 edition of The Trinity Tripod. Although there’s less of the progressive and art rock on the air today — once a mainstay during the heady 1970s — it still has a place at WRTC, but so too does everything from alternative, punk, techno, house, indie and of course, good, ol’ AOR offerings. WRTC boasts more than 30 hours of jazz programming each week — more than any other area station. Styles run the gamut, as do the personalities of the hosts! Be it conventional straight-ahead, hard bop, fusion, modern or smooth/cool, there’s something for every jazz fan. Everything, including the kitchen sink: Jazz coordinator Bob Parzych has hosted The Kitchen Sink of Jazz for decades. Over the years, so many great artists have been interviewed on WRTC. Dave Brubeck, Ray Brown Jr., Larry Carlton, Kal David, Russ Freeman and Jeff Kashiwa, John Pizzarelli, Kenny Rankin, David Sanborn, Dianne Schuur and Grover Washington, Jr. among them. One of the most interesting interviews was with the legendary Toots Thielemens who called from the back of a van going through the hills of California. The famed impresario George Wein, best known as the founder of the Newport Jazz Festival — and said to be the “most important non-player in jazz history” — shared some fond memories and insight from his storied career during an on-air appearance at the station. When it comes to Caribbean programming and styles thereof, WRTC has the most in the state. Be it roots reggae, ska, dancehall, rocksteady, zouk, lovers rock, compas, bomba, reggaeton, calypso, soca or merengue, a diverse mix of hosts provides nearly 20 hours of Caribbean sounds each week. Each show takes a different approach on the good-time sounds from the West Indies. Get rhythm: Samba Fest 2013 along the Hartford riverfront was carried live by WRTC. Over the years, we’ve interviewed Black Uhuru, Buju Banton, Ken Boothe, Dennis Brown, Jimmy Cliff, Beres Hammond, the Heptones, Luciano, Freddie McGregor, Sizzla, Junior Marvin, Maxi Priest, Shabba Ranks, Shaggy, Toots and the Maytals, the late Bob Marley’s sons, Julian, Ky-Mani and Stephen, Yellowman and many others. 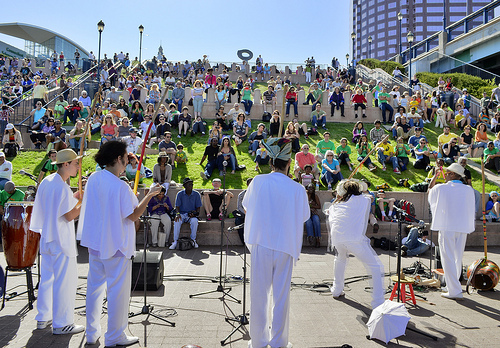 Since 2006, the station has broadcast the Trinity Samba Fest from the Hartford waterfront featuring regional and international talent. Live from Memphis: A promo poster about the fourth-annual “Soulsville” special — a six-hour broadcast from Memphis, Tenn.
and they complement each other nicely with differing approaches, but a solid and consistent delivery of the goods. Midweek, we offer World O’ Funk. This the long-running program features material rooted in the foundations of funk to present-day artists. Leaning heavily on George Clinton’s Parliament and Funkedelic line-ups as well as the horn-laden godfather of soul, James Brown, there’s also no shortage of Sly & The Family Stone, Average White Band and Mandrill. Regular interviews with those who made it happen are part of the package. Rounding out the genre, Saturday’s Greasy Tracks is steeped in Southern soul, but always manages to mix in late-1960s and early-70s Brit blues stylists and extended acid jazz and fusion instrumentals. 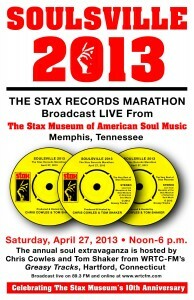 Since 2010, Greasy Tracks has presented an annual, single-day, Stax Records marathon of six or seven hours. The “Soulsville” special, believed to be the only program of its kind in the country, has featured interviews with 40-plus Stax-specific guests, including a veritable who’s who of southern soul greats: William Bell, Steve Cropper, Eddie Floyd, Wayne Jackson and David Porter among them. On the road: Tom Shaker (left) and Chris Cowles in front of the Stax Museum of American Soul Music in Memphis, Tenn., where they co-hosted a WRTC remote broadcast in 2013. 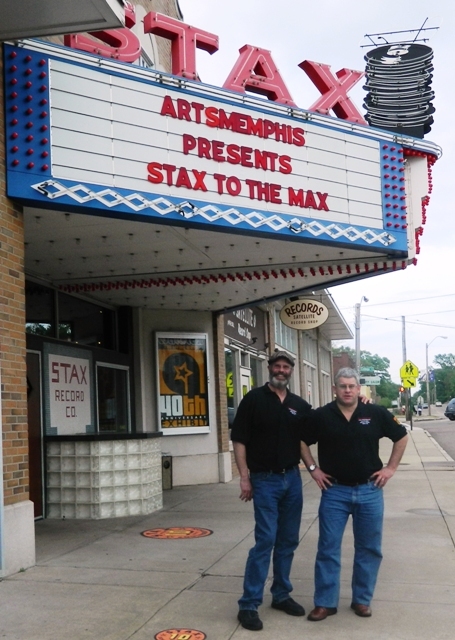 While carrying play-by-play of Trinity athletic contests from around New England for decades, our music programs rarely ventured far from the home studio — until 2013 when co-hosts Chris Cowles and Tom Shaker trekked to Memphis, Tenn., to broadcast the “Soulsville” special directly from the Stax Museum of American Soul Music! Tracing its origin back to the Black Experience block of programs, the formative years of Thought Power focused on public affairs concerns. It produced original, vibrant, educational programming and increased awareness of Afro-American culture. 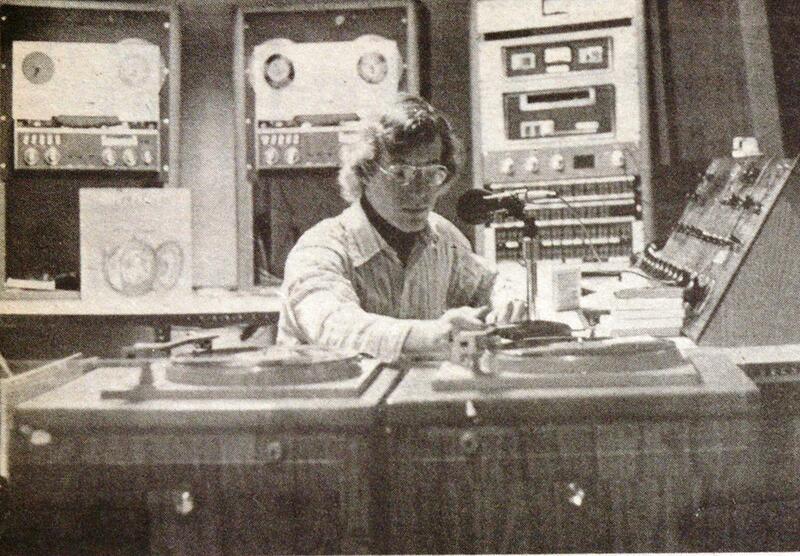 Spinning platters: A WRTC host in 1970. While music was the primary focus, there were also live spoken word and poetry readings. At the then-new Hartford Civic Center, Thought Power hosts produced a pair of dance party/fashion shows DJing recorded music along with live bands. These days, Thought Power offers listeners the largest collection of hip-hop, rap and club music around. Every week-night brings a different spotlight on Latin programming as WRTC has it all, ranging from Latin contemporary music to salsa, merengue or bachata. But don’t forget reggaetón and freestyle — we’ve got it all — and the most knowledgeable hosts around. Disfrutar! Bantams on the air: WRTC broadcasts four of Trinity’s teams in NESCAC action. WRTC’s veteran sportscasters provide home-and-away coverage of the Bantams in NESCAC football action in the fall with coverage usually running between noon-4 p.m. The winter brings ice hockey and men’s and women’s basketball. We’ve long produced programs focusing on community affairs and currently feature The Community Talk Show, a biweekly panel discussion exploring topics ranging from social welfare, healthcare and politics to economic development, law enforcement and unemployment. In 1996, WRTC carried the second presidential debate between incumbent Bill Clinton and challenger Bob Dole which was moderated by PBS NewsHour host Jim Lehrer in San Diego. 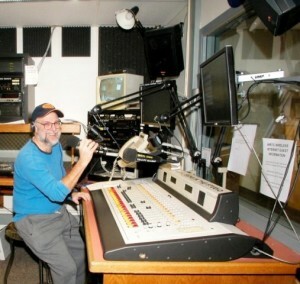 Although Radio Trinity College has the distinction of being Hartford’s first non-commercial station, its origin was about as humble as could be. 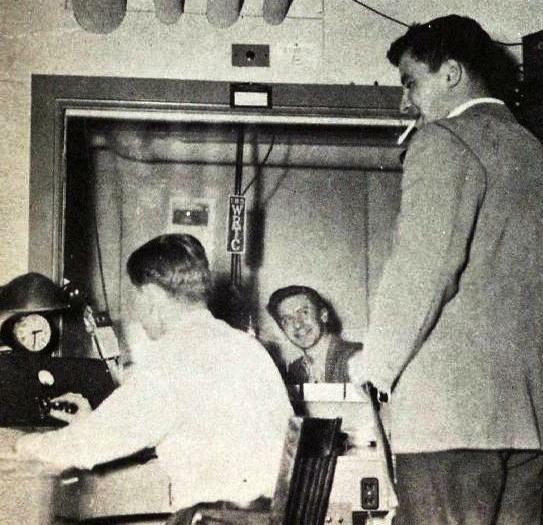 As a licensed entity, We officially went on the air at 7 p.m. on Feb. 26, 1947, broadcasting at 620 kilocycles on the AM dial from an ad hoc set-up in Jarvis Hall. This was less than two months after the college was alerted (Dec. 30, 1946), that the call letters “WRTC” were available and had been registered with the Federal Communications Commission. Stand by! : Advertising manager Fred Campbell (right) talks with engineer Red Thomas and announcer John Paddon (center) in 1949. The debut broadcast was conducted by four students who shared a single microphone and a pair of turntables and broadcast with a homemade 10-watt transmitter.Total cost for the equipment was about $50. 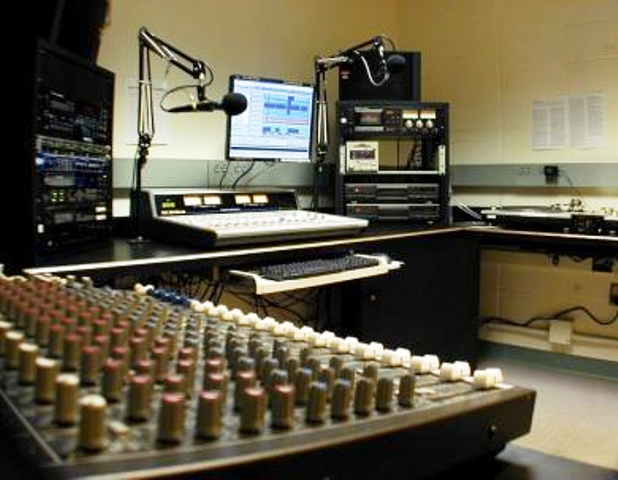 Not long after that, the new station set up a studio in Cook Hall. More modest beginnings there may not have been as the station’s signal reportedly carried only 42 feet in the initial stages as technicians utilized the college’s electrical wiring system as a “carrier current” thereby allowing the signal to be picked up by all buildings on campus, yet only have a maximum broadcast radius of several hundred feet when working optimally. 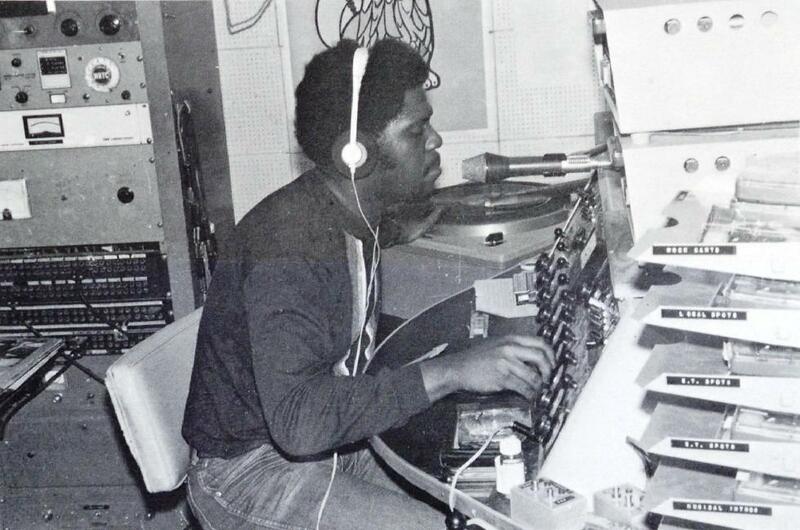 On-air in Cook: A host cues up an album during a 1978 broadcast from the basement of Cook Hall. 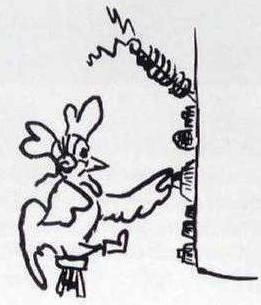 The early broadcast days were short and oft-plagued by technical challenges. Following its debut — which featured a performance by The Pipes, a student vocal group, as well as addresses by the college president and dean of students – the station not only broadcast a wide range of music, but also education-specific programming including lectures and discussions. There were even performances by college’s various vocal groups: The Chamber Players and The Trinidads, while The Jesters, a dramatic troupe, added a series of 15-minute programs. WRTC was widely regarded as one of the best college stations in the region and in its first decade, a number of top entertainers were interviewed, including legendary singer Patti Page, pianist/band leader Stan Kenton, singer Toni Arden and band leader Ralph Flanagan. No different than today, there was an effort to get the newest releases on the air as quickly as possible. Within two months of going on air, the station was scrambling to stock its growing record library which boasted more than 500 titles. Through a special arrangement with the exclusive New England distributor of Capital Records, the station was able to secure Capital’s latest releases before they were in stores and in many cases, obtain platters prior to their formal release. By 1955, the library had more than 23,000 recordings. We were an early member of the Intercollegiate Broadcasting System (IBS), a group of 52 non-profit college stations also forming the Ivy Network, an effort to exchange programming. The IBS was divided into nine regions. The center of operations was at the University of Rochester in New York and, in 1950, WRTC served as the New England headquarters of the organization. WRTC remained an important IBS affiliate, but would drop its membership in 1955. Regular broadcasts ran Monday through Friday, 11:30 a.m. to 2:30 p.m. and 5 to 9 p.m. Programming featured a request hour of swing music, an hour of classical in the evenings, a weekly sports program and periodic broadcasts by The Pipes. The station ceased operation each summer. By 1948, the station joined a “new and revolutionary kind of broadcasting”: Frequency Modulation. WRTC would rebroadcast WDRC programs on its FM signal. In 1949, we moved to 550 AM, but returned to 620 only a year later. Also that year, Newsweek began sponsoring a 15-minute program on Thursday mornings which featured a commentary from a recent issue of the magazine. That year, arrangements were made with Paris-based Radiodiffusion-Télévision Française to present a weekly pair of translated programs that ran 15 to 30 minutes each. The longer shows featured classical music, while the shorter spotlighted then-current artists like Edith Piaf and Jean Sablon. Where we reach: WRTC’s signal is diagrammed in this coverage pattern. In 1952, a $2,000 infusion enabled us to procure a new audio console — a better one than those at Hartford’s commercial stations. Broadcast hours increased again as we were usually on-air for 12 hours during weekdays and 16 hours on the weekends. 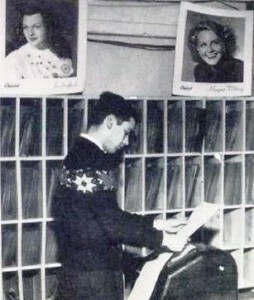 In 1952, WRTC also began its annual “Miss WRTC” contest. As The Hartford Courant reported, Sue Hall of West Hartford was crowned after a two-month process culminating in a show in which contestants were judged on personality and appearance. She was responsible for representing the station at public events and was introduced to visiting recording stars. . Although considered a non-commercial operation, WRTC did attract a number of sponsors — including such household companies as Camel, Lucky Strike, and RCA Victor — to help defray operating expenses. The Hartford Times wrote that we could attract sponsors with our “professional polish.” At the time, Trinity College only provided a third of the operating costs, so drawing local, regional and national advertisers was crucial. This would all change in March 1955. Following a second warning from the FCC, the station was forced off the air for broadcasting beyond its prescribed limits. The range was supposed to stay within the general proximity of campus but it was not uncommon for it to be picked up 25 miles away in Springfield, Mass.! Students said they regularly “rode the signal home” when driving back from Boston. A tale commonly told at the time was that the chief engineer had allegedly hooked up the station’s transmitter to a telephone line linked to the main campus telephone connection which in turn ran to the city of Hartford’s phone cables, thus turning them into a giant antenna, making it possible for WRTC’s signal to be picked up as far west as Chicago. Station management was quickly changed but we would be off the air for 19 months. During that period, station members worked diligently to restore WRTC as a bona fide broadcasting entity. By the fall of 1956, negotiations with the FCC finally resulted in WRTC being allowed back on air, but this time on the much less desirable FM band and as a non-commercial educational operation. The bulk of our new FM air time would be dedicated to music. The cost of an FM transmitter was a big challenge but, ultimately, $1,400 was raised for a hand-me-down from WELI-FM in New Haven. The unit was shipped to California where it was re-tuned and refurbished by the manufacturer before being shipped back to Connecticut and installed. The transmitter was the sixth of its kind built. Hours of operation were drastically reduced: the broadcast day started at 3 p.m. and ended at midnight. While it was later changed from noon to 1 a.m., management had a goal of 7 a.m. to 1 a.m. Although patented in 1933, FM broadcasting was a novelty at best in those early days. It wasn’t until late in the decade that commercial FM stations started to emerge and FM radio wasn’t truly commonplace until the 60’s. WRTC was assigned 89.3 MHz on the FM dial – the frequency it has held since — with an effective 145-watt radiated power generated by a transmitter with an output of 250 watts. Our capability to broadcast the latest news was greatly improved by the acquisition of a Teletype Model 15 machine. The station began five-minute news breaks on the hour along with 15-minue roundups at 5:45 and 11 p.m. and a daily 10-minute sports report. The news is on: WRTC’s Teletype Corp. Model 15 machine provided breaking news updates as the station began airing five-minute news spots on an hourly basis in 1954. The Model 15 was the workhorse of radio and television news rooms from coast to coast for decades. It gave the station breaking news from the International News Service — later United Press International — as it cranked out 10 feet of news type every hour. As the same machine was vital to communications within the military, it was only fitting when an ex-Navy teletype operator named Art Cowdery became the station’s news editor. Oddly, tension arose between the station and the athletic department which felt that broadcasting basketball games would lead to reduced student attendance at home games. They thought students would rather listen to games in the comfort of their dorm rooms. They were all for coverage of road contests, though, which we did without fail despite incurring costs as high as $150 each for telephone line rental. Still, the department, along with the Athletic Advisory Council, felt that banning home game radio coverage would boost attendance. The station offered the athletic department free advertising a week prior to home games. Plus, WRTC would urge students to attend games instead of listening to the play-by-play on air. The 1960s were a time of great social change and WRTC’s new non-commercial “educational” orientation brought with it some interesting wrinkles. In March 1960, the National Broadcasting Company (NBC) featured the Trinity Chapel Choir on its “National Radio Pulpit” program, rebroadcasting a WRTC recording. The organization drew praise in April 1960 for its educational series, “Classrooms Unlimited.” Considered the first program of its kind in New England, Trinity College faculty broadcast 20-minute lectures intended, initially, for a pair of area high schools. The focus was English literature. Emily Bronte’s “Wuthering Heights” and Thomas Hardy’s “Return of the Native” were aired five times daily every two weeks. Prior to ‘65, WRTC had a rather formal feel. One would have to admit… it was dry. “Music for Dining,” an early evening program and mainstay for many years, broke up the dominant flow of Classical and Broadway. Jackets and ties were mandatory in the studio as they had always been. Stereo FM wouldn’t be a reality until 1961, the same year WRTC increased its power to 300 watts. In October 1961, the Federal Aviation Agency (FAA) — in 1966 it became the Federal Aviation Administration — decided WRTC’s proposed new antenna posed no undue hazard to the then-bustling Brainard Field airport. Less than a month earlier, a Western Union telegraph from the FCC informed station managers that it had gained preliminary permission for the antenna, but the FAA had the final say. 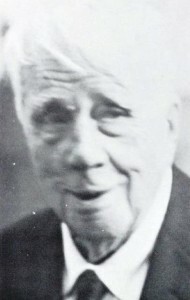 Frost appearance recorded: A 1962 appearance by poet Robert Frost was recorded by WRTC staff and later rebroadcast across the country. WRTC recorded Frost’s speech allowing hundreds of thousands to hear it on the Educational Radio Network. The network, based at WGBH-FM in Boston, made the tape available to 37 member stations, including those in New York, Philadelphia, Washington, D.C., and three in Canada. That year, WRTC carried play-by-play of all of Trinity’s football games, home and away, as well as the presidential election. May 16-19, 1969, the station produced an ambitious “Top 1,000 Weekend.” Following a two-year research project into the history of pop music, our staff played the top 1,000 pop recordings of all time. DJ Dave Gilbert did a 24-hour marathon during this feature, going from 6 p.m. Saturday to 6 p.m. Sunday. Looking for listeners: An ad that appeared in a 1977 issue of The Trinity Tripod. In April of ‘71, the station presented Orson Welles’ “War of the Worlds” as part of the “Electric Saturday Radio Show.” The classic film “2001: A Space Odyssey” was discussed by screenplay co-author Arthur C. Clark along with famed anthropologist Margaret Meade. In 1974, WRTC had a crisis. The stark reality was that the transmitter was failing and the funds to replace it didn’t exist. The situation was so dire at one point that the station was off the air for nearly two months. Ultimately, management was able to secure sufficient backing to address the expenses. It was not uncommon for WRTC to meet other area stations on the softball diamond – this time to play, not broadcast! WRTC faced teams from WWUH and WHCN during spring and summer encounters. In 1975, in cooperation with WFSB-TV, we began broadcasting a 30-minute weeknight Spanish-language newscast at 6 p.m.
Twenty high school students living in a low-income section of Hartford began a WRTC-sponsored 14-month trainee program in radio broadcasting. Six hours of classes were offered weekly by eight members of the WRTC staff. 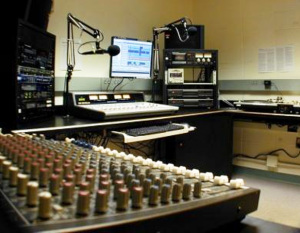 The program covered studio operations, advanced production techniques and FCC rules and regulations — all geared to prepare students for FCC exams and a potential career in broadcasting. 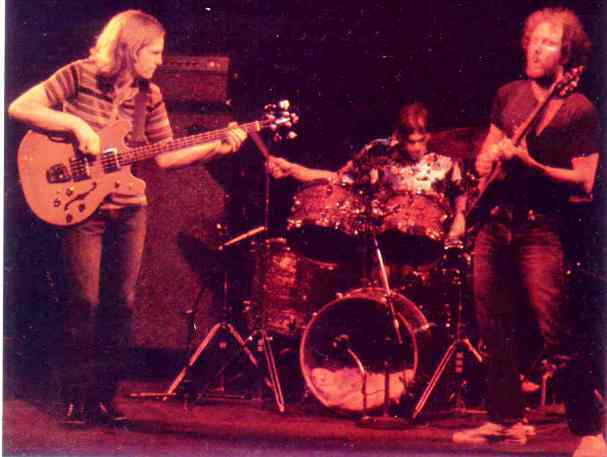 In 1976 the station went stereo. 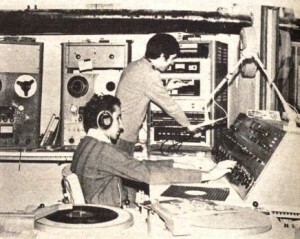 Two years later, Monday through Friday rock programs played entire, recently-released albums at 4 p.m.
On-air teamwork: Host Howard Goldstein (left) makes an adjustment on the control board while Jack Santos turns on a public service announcement in 1974. 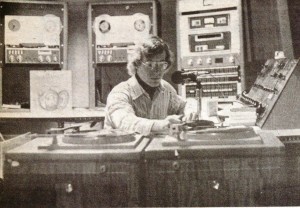 Despite being blind, Goldstein was on the WRTC staff for many years. WRTC broadcast a fundraising disco in 1978. Students donated $1.50 to take part. Non-students had to pony up $2.50. Thanks to Chris Cowles, Howard Hoyt, Reynolds Onderdonk, Bob Parzych, Gary Reger, Maurice Robertson and John Schwenk. Photos courtesy of Trinity Archives, except where noted.